As discussed in our last post on The Rise of Artificial Intelligence, the days of limited computing power and less sophisticated techniques that plagued AI in the past are over. Recent advances in computational power and machine learning make solving AI problems not only possible, but also quite lucrative. Finance and healthcare are obvious applications for AI. However, another lucrative opportunity is application of artificial intelligence in professional sports. Much like the finance industry, the world of professional sports is very data driven. Throughout a game, players and coaching staff are forced to process vast amounts of data to make decisions instantaneously. When there's a lot on the line for stakeholders, it makes solving these business problems that much more exciting. We're in the middle of the NBA playoffs at the time of writing, so let's take a look at the interesting things going on in the NBA. Second Spectrum, an LA-based startup backed and advised by Steve Ballmer, has built an AI driven platform for tracking player and ball movement in the NBA at a granular level. Second Spectrum's technology uses AI to derive insights. Insights that players, coaches, and other stakeholders such as sports commentators and even fans at home can use to make decisions. 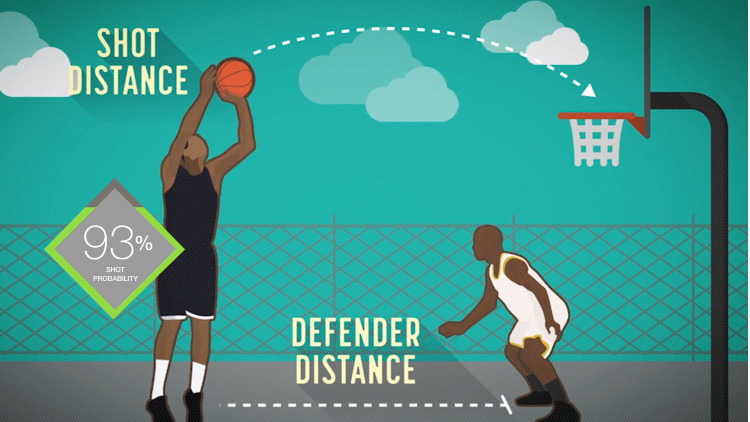 As @KingJames has dominated the paint this #NBAPlayoffs, @secondspectrum gives us closer look at how! Through image recognition and neural networks, information is classified by the system, much like the human brain. However, unlike humans, neural networks can be trained to do classification with much more accuracy. The system overlays fantasy stats for fans at home and is able to recognize and predict which plays based on their preferences. This has profound impact for broadcasters. Overall AI technology enhances the experience for many stakeholders both on and off the court. Basketball is not the only sport using AI. Let's take a look at the NFL. With 22 players on the field, predicting outcomes becomes quite difficult. Not only are there more players and actions on the field, the number of variables increases exponentially. With added complexity and so many breaks in between downs to call strategic plays in only 40 seconds, the NFL is one of the most fitting sports to use AI. It's not only a game of data, but of providing context for that data and making decisions. Back in 2015 Alex Tellez of H20 built a deep learning model that could predict whether or not the New England Patriots would run or pass the ball with about 75% accuracy. In a sport where any edge is a good thing, this AI in the hands of a defensive coordinator would be a game changer. Of course AI can be used before players get on the field as well. Tellez built a neural network to analyze and predict rookies' performances in the NFL scouting combine. This type of analysis would be critical when drafting new players. Much like business, the world of professional sports is competitive. To stay on top both the NFL and NBA have turned to AI. These applications, however, are barely scratching the surface of what artificial intelligence can do. Not sure how Artificial Intelligence can help your organization?